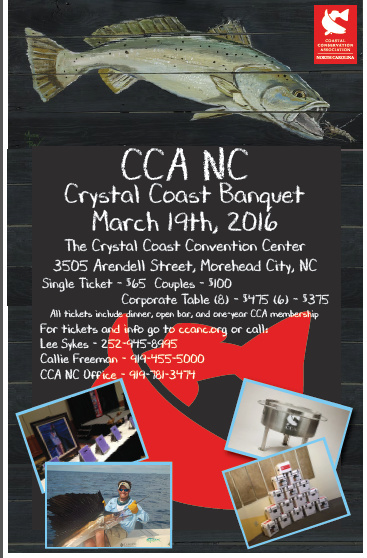 Join us Saturday, March 19th at the Crystal Coast Civic Center for the Crystal Coast Chapter of CCA’s Annual Fundraising Banquet. Doors will open at 6pm. We have some exciting raffle prizes this year including sought after firearms and top-rated fishing gear to get you ready for spring fishing! You won’t want to miss the pinnacle of the evening, the always exhilarating Live Auction featuring local and destination guided hunting and fishing trips, exotic vacations to Belize, Costa Rica and Saint Thomas, beautifully hand-crafted mahogany and teak furniture, original artwork by local artists and much more. We will also be hosting a wine tasting this year along with tables dedicated to items exclusively for the ladies! Come have a ball and help us support the resource! Tickets are $65 per person or $100 a couple and include a mouth-watering catered meal, open bar and your annual CCA membership!